Well, it’s been an up-and-down couple of weeks since my last post, and for that I apologize. I’ve been working on the copywriting side, and even visited with the GER last week. But I did get lucky right after my last post—in addition to a lot of good feedback, I got a call from Chef Michael and his wonderful wife, Rosemine, and we talked for over an hour! I won’t give away any of their trade secrets, but they did have a lot to say, and I do appreciate their time. Chef Michael has been making tasty food for many years, and they opened the Gourmet Kitchen in 2011 in The Woodlands/Tomball area. They specialize in corporate events, like the open house at Woodlands Wellness. But what I also didn’t know is that they also do event catering for the Bernhardt Winery in Plantersville, TX. No kidding! I’ve not even heard of that winery, but that’s not surprising, since Texas has quite a number of them, including Haak Vineyards & Winery (in my part of town, they do weddings) and Messina Hof (in Bryan, near Texas A&M.) If you’re in the mood for a winery trip, check out Bernhardt’s concert series, both winter and summer—and you’ll be able to sample some of the same delicious food from Chef Michael’s Gourmet Kitchen while you’re there. I’m not saying it’s going to be gluten-free like it was at the open house—that all depends on what the winery (or any client) requests. But whatever it is, you’ll be treated to some of the best tasting food north of the Tunnel. I asked Chef Michael what got him started making gluten-free and yeast-free food. Most caterers don’t want to deal with “special menus” but can accommodate vegetarians with easy substitutions (I know that from corporate experience.) His answer was simple: “Dr. Davis asked for it.” Now that option is available on his catering menu for Dr. Davis as well as anyone who is looking for a healthier option for their event. You can read more about it here. 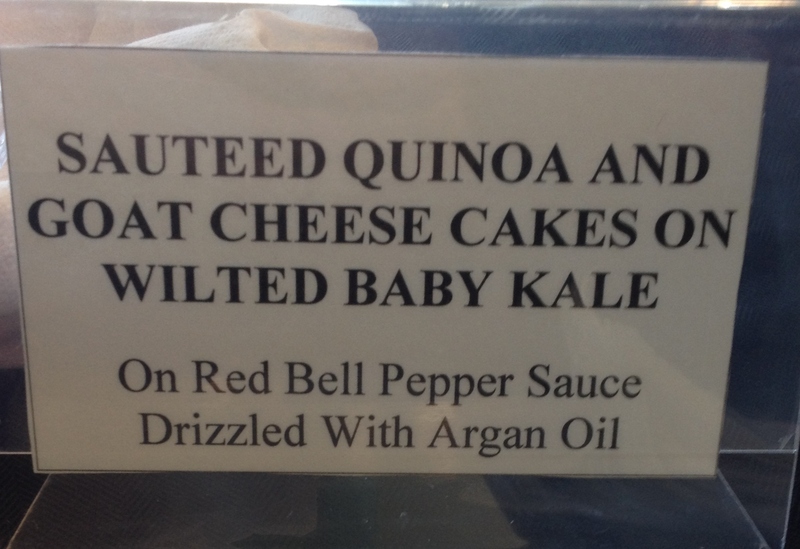 Definitely not what you’d call “diet food,” and utterly delicious. Well. . .that was one of the questions I asked Chef Michael and Rosemine: What the heck is Argan Oil? Rosemine told me, and since then, I’ve certainly learned a lot about it. Now, before I tell you more, let me preface it this way: if you’re familiar with making anything with chocolate (including things like cakes and ice creams) or are a fan of the Barefoot Contessa, you’ll know that adding a small amount of coffee in a chocolate recipe helps bring out the chocolate flavor. You don’t taste the coffee, but it enhances and improves the taste of whatever you’re doing with the chocolate. My favorite Yeast Free Brownies are a perfect example. The Argan Oil in Chef Michael’s cooking was like that. Not something I noticeably tasted in the forefront, but something in the background that really enhanced the flavor of everything. Olive oil is great, and so is coconut oil, but Argan’s warm, nutty flavor is a little something special without covering or overpowering the rest of the flavors. Argan Oil comes exclusively from Morocco, and is used primarily in European and Mediterranean cooking. It’s only been known and available in the US in the last ten years or so (and why have I never heard of it?) One website I researched said that it was unknown outside of Morocco until French chefs started putting it in everything. Now Argan is gaining ground as a gourmet oil and as a health/wellness/beauty product. Processing and extraction of Argan Oil are all done by hand, by Moroccan women who make a living with the arduous process. It is a nut oil—so if you have a nut allergy, it may not be for you. (Remember: I’m not a doctor, just a food blogger.) The nuts are dried, and are heated to remove the “nutty” aroma for cosmetic use. The culinary oil is then toasted to enhance the nutty flavor that it’s prized for. The nut comes from the Argan tree, or Argania spinosa. The nut kernel is surrounded by a fleshy fruit, which is removed by hand and used for animal feed. Attempts at mechanizing the separation and extraction process have not yet worked, but I’m sure that will change in the future when someone figures it out. For now, the local women’s cooperatives that do the labor-intensive extraction work helps the women make a living and provide for their families. So what do you do with it? Unlike olive or coconut oils, you generally don’t cook with Argan Oil. It’s something to be used as-is and in small amounts, like a salad dressing or a “finishing oil.” It’s a bit like the fancy pink Himalayan salt I bought at the Metropolitan Food & Entertaining Expo a couple of years ago. You’d sprinkle a pinch on top of something right before serving, rather than measure some and add it to the recipe. Argan Oil is also used as a dip, similar to the little dip dishes of olive oil in Italian restaurants. It doesn’t have the high smoke point of coconut or olive, so a few drops at the end is all you need. Argan Oil is similar to olive oil in health benefits, too, rich in Vitamin E and other essential fatty acids. It may also be more resistant to oxidation than olive oil. Some people swear by taking a tablespoon or so first thing in the morning. There is an additional product from the Argan tree, called Amlou, with a consistency similar to peanut butter. It’s a Moroccan thing, much like peanut butter is to us. It’s made from stone ground almonds, local honey and Argan Oil, and is also available jarred. Spread it on crackers, toast, or whatever you like. Topically, Argan Oil is used straight for sunburn, wrinkles, acne, stretch marks, and as a hair treatment—but only a little at a time. Medical benefits (according to ArganFarm.com) include lowered cholesterol, anti-inflammatory and anti-cancer properties, pain treatment, lower blood pressure and regulation of heart function. Again—I’m not a doctor, just a food blogger reporting what she reads. While the topical applications are probably safe and effective, I can’t positively answer for the medical benefits; you’d have to try it and see, assuming you don’t have a nut allergy. Now, I didn’t know the rest of all this about Argan Oil. About a year or so ago, one of my writer friends posted a comment on Facebook about “Morocco Oil” that she bought to use in her hair. (That’s another name for Argan Oil.) She loved it. I meant to try it and I forgot. A couple of months ago, Neighbor K told me to try some Pantene shampoo and conditioner that contained Argan Oil. After looking at a dizzying array of Pantene products, I found the right one and wielded my coupons at the checkout. Then while Rosemine explained it to me on the phone, I walked into my bathroom and realized that I really did have some. Of course, it wasn’t straight oil, it was in Pantene shampoo and conditioner, and some Tresomme hair styling stuff that contained some Argan Oil, noted on the label. If you’re interested in learning more about Argan Oil, there are a number of sites dedicated to it. This article on Food Republic gives a writer’s experience learning about Argan Oil while visiting Morocco in 2012. In the US, Zamouri Spices is a Kansas-based company that not only imports Argan Oil for culinary and cosmetic uses, it also carries a number of Moroccan products that are difficult to find here in the US. (Being from New Orleans, it’s not something I’d ever look for.) They also carry spices, tangines (those round triangular-lidded clay pots), copperware, tea and tea accessories, and other related items. From the UK is Argan Oil Direct, which also has free shipping worldwide and a USDA organic certification. This site offers two free e-books (which I haven’t read yet) and has a lot of information on it. This is also a company with a home base in Morocco, and is part of one of the Berber family that owns land that the trees grow on. If you don’t mind ordering online from overseas, ArganFarm.com is run by a native Moroccan named Bader Eddine, and he lives in Essaouira City. His company sells direct from the people who extract it, and also offers a free e-book so you can read more about it. Although the book is well written, Bader’s English is a bit wonky, since it’s probably not his first language. That’s OK–at the end of the book is an offer for free shipping to 200 countries (including the US.) I didn’t see any mention of organic in the book or on his website, but it might be. Please note that I have not personally ordered from any of the overseas websites. If you do, make SURE to use a credit card, so that if something goes wrong, you can, if need be, dispute it. Amazon also has a large selection of Argan Oils available from several vendors, some from Zamouri, for both cosmetic and culinary use. If you’re in The Woodlands, and your company has an upcoming function where the food is that important (or if your event is in The Woodlands), make sure you contact Chef Michael’s Gourmet Kitchen at 281-660-8680, or email them at cateringbychefmichael@gmail.com. You can see more on their website, including menus, additional information, and even a few recipes! Chef Michael and Rosemine can help design a menu that’s perfect for whatever you need. You can see some pictures of their elegant spreads, and even a picture of them at the winery, in their online gallery. I’m working on a few things for upcoming posts. But darnit, sometimes things are so new that I can’t get my hands on it yet. I’ll let you know when I can.